Help musicians deliver inspired performances by giving them better headphone monitor mixes: 5 Nx Head Trackers for use with the Nx Virtual Mix Room plugin. Having a comfortable headphone monitor mix is often what separates an average recording session from a great one. The Nx Head Trackers, combined with the Nx Virtual Mix Room plugin, let you create maximally clear and detailed headphones mixes for as many as six musicians (or five musicians plus one engineer) at a time. Nx Virtual Mix Room is a virtual monitoring plugin that simulates an acoustically treated room inside any headphones. 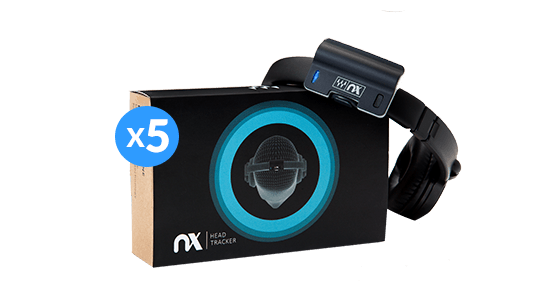 Together with the Nx Head Trackers, Nx delivers spacious, three-dimensional headphones mixes that replicate the experience of listening to monitors in an actual room. With Nx, recording musicians can enjoy a more open, uncluttered mix, with more clarity and separation. Singers can hear themselves better and have an easier time singing in tune. All musicians can hear their playing more clearly in the context of the mix and deliver more natural performances. To send Nx headphone monitor mixes to up to six people, each with an Nx Head Tracker, simply create an aux buss for each monitor mix, and insert the Nx Virtual Mix Room plugin on each buss (see detailed instructions). 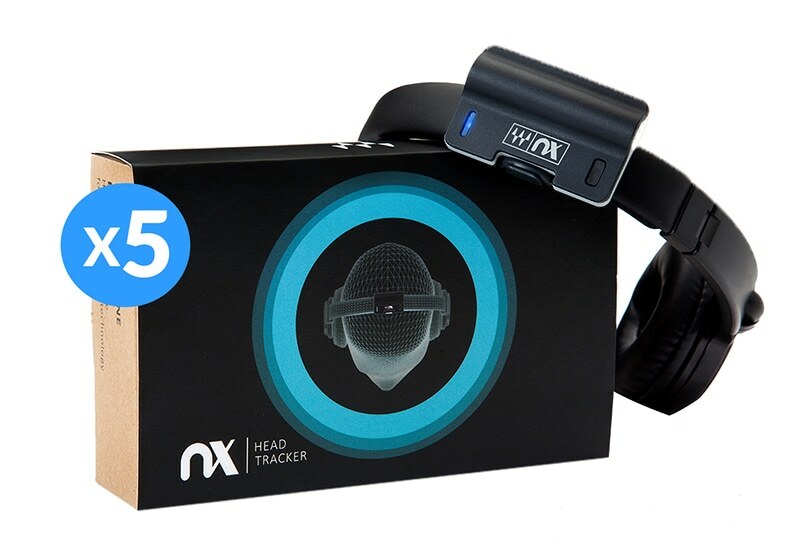 With more detail and depth than ever, the Nx Head Trackers combined with the Nx plugin provide the optimal headphone experience during recording sessions. To send headphone monitor mixes from the Nx Virtual Mix Room plugin to as many as six Nx Head Trackers simultaneously, follow the steps in this article. “In many instances, headphones are the only element in a tracking session that impede the creative process rather than improve it. Nx changes that completely. It sounds too good to be true, but I have to say that Nx virtually removes the constraints of headphones, allowing musicians and vocalists to reach their full creative and technical potential. It creates a more musical recording experience by allowing the musicians to interact with their instruments and with each other, without feeling any restrictions from headphones. Every musician I’ve used Nx with, without exception, commented on hearing more detail in regards to their own instrument as well as the other instruments in comparison to other tracking scenarios. In my experience of tracking with Nx, vocalists are able to hear pitch better, bass players are able to hear the air of the bass tone, even when recording direct, and drummers are able to lock with the other musicians better.